If you’ve ever picked up the latest issue of Vogue, and read about this season’s “new black”, you know that “it colors” come and go in fashion. For example, last spring the hot shade in fashion was yellow, and this winter, the “it” color is purple. But if you’ve ever tried to wear one of those colors and found that you just didn’t look right, you need to keep reading. Regardless of what the trendy colors are, there are some shades that are always going to look good on you, and some that aren’t. No color looks good on everyone, and it’s just a fact. This has to do with your coloring, or the way your eye color, hair, and skin tone combine to give you a look. Your coloring makes the difference between whether you can wear gold or silver jewelry, whether that bright red halter top will look fabulous or horrible on you, and even what shades of makeup you can pull off. It’s really important to know what your perfect colors are, or you risk looking completely messed up! 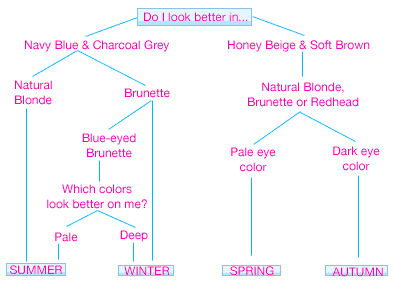 So how can you figure out what colors look best on you? Believe it or not, there’s one old school way to tell what your colors are that is still relevant after many years. Seasonal color analysis, the study of a person’s coloring, is what we’re going to get into today. Color analysis breaks people’s colorings down into the four color seasons -Spring, Summer, Autumn, and Winter. These color seasons are broken down even further, into 3 different categories per season. It’s not a perfect system, but it’s really helpful if you want to get a basic idea of what shades work for you. Now that you know what season you fit into, keep reading to find out what that means for your clothes, shoes, accessories, and makeup! By the way, If you’re having trouble with the first question, grab a mirror and find a well-lit place. Bring one item of clothing each that’s navy blue, charcoal gray, honey beige, and soft brown. (If you don’t have one of those, don’t worry. Just use what you have.) Put each piece of clothing up near your face, and observe what it does to your skin tone. If the color becomes the focus instead of your face, it’s not right. If it makes you light up, makes your eyes look brighter and your hair look better, you’ve found your winner! Now that you know what general category you are, there are three types of coloring within each “season.” Sound confusing? I promise, it’s really not as bad as it sounds. Find your season below, and read the descriptions to find out which type you are & see your best colors! UPDATE: As of 10/19 I’ve updated this list to be more accurate and in-depth with info I got from the book Color Me Beautiful. Some people thought they were left out of the list, so I hope it can include almost everyone now. Also, to be more specific, if you are Asian, Latina or African, you will probably be an Autumn or Winter. If you are Caucasian, you will probably be a Spring or Summer. Hope that helps clear up some confusion! Eyes: Blue, green, turquoise, or light hazel. Hair: Light to medium golden blonde, ash blonde or light to medium brown. Skin: Ivory with peach tones, pink beige. Eyes: Turquoise blue, green, golden brown or topaz. Hair: Medium to dark brown, or brown-black. May have red highlights. Skin: Bronze, deep warm brown, brown-black, light ivory, light peach, or porcelain. Eyes: Topaz, olive green, light hazel, or warm turquoise. Hair: Light golden brown, red, strawberry blonde, or deep golden blonde. Skin: Bronze, golden beige, ivory, or porcelain. May have freckles. Eyes: Blue, gray or green. Eyes: Gray-blue, hazel or soft turquoise. Hair: Light to medium ash brown, mousy brown. May have blonde in it. Skin: Light to medium neutral beige, ivory. Hair: Medium to deep ash brown. Little to no red tones. Skin: Ivory, pink beige, gray beige, or neutral beige. Eyes: Dark brown, dark hazel, black, or dark green. Hair: Medium brown, medium to deep auburn, dark brown deep chestnut or black. Skin: Warm beige, neutral beige, golden brown, dark brown, olive. Eyes: Light brown, soft hazel, blue, or gray-green. Hair: Golden blonde to medium brown or mousy brown. May have blonde or red highlights. Skin: Ivory, neutral beige, warm beige, golden brown. Skin: Bronze, golden brown, golden beige, ivory, or warm beige. Eyes: Black, black-brown, or dark hazel. Hair: Black-brown, medium brown, steel gray, or salt & pepper. Skin: Black, medium beige, black-brown, or olive with no pink or peach undertones. Eyes: Bright blue, hazel, violet, or green. Hair: Black, chestnut, medium brown, or dark brown hair. Eyes: Charcoal gray, blue, dark brown or violet. Hair: Blue-black, silver, salt & pepper. No red tones. Bear in mind that the colors above are not an all-inclusive list of the colors that will work for you, but they are some of the best colors that you should definitely try to incorporate into your wardrobe! Even just a few new tops in those colors will make a huge difference. Also, you may fit into a couple different categories. That’s okay, it’s normal and no big deal. The seasons are just supposed to give you a general idea of your colors – they’re not supposed to be strict rules that you need to follow religiously. If you try on some clothes in your colors, you’ll quickly learn that wearing the right colors makes a huge difference in the way you look. I encourage you to experiment with different shades and see which ones look best on you, as well as which ones you like the most! Then buy these colors up whenever you spot them in stores. If you want, you can print this article out and take it shopping with you, so you’ll always have your colors at hand. What do you think of seasonal color analysis? Is it lame or helpful? What about your personal colors – are they a fit for what you already have in your wardrobe, or do you need to go buy some new pieces?